Being unprepared when traveling can cause quite an inconvenience. As a result of this, we tend to over-pack. This is less of an issue with smaller items however when you get into the larger ones, like blankets, coats, and shoes, this can cause some frustration. In addition to the lack of space, this can cause additional baggage and thus incur additional baggage fees. We have created a list of the top travel blankets that are not only compact but warm, waterproof, durable and machine washable. These blankets are diverse in that they have their own unique uses. 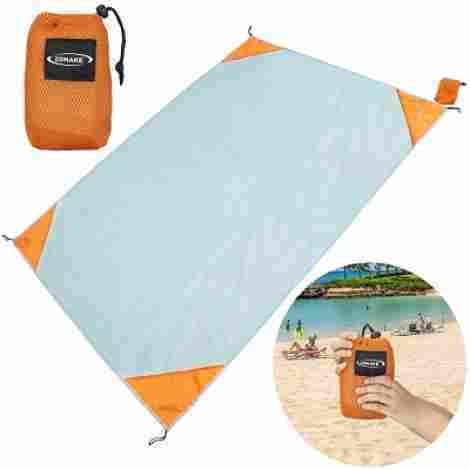 When going on a picnic or to the beach we want a blanket that won’t collect and hold onto dirt and sand. We also want something light and compact that is easier to travel with (especially when hiking and carrying an already heavy backpack) and includes additional features like being ultra-lightweight, waterproof and puncture-proof. We also want something that can handle a little more wear and tear than our standard house blanket. This list goes through the top blankets on the market. We chose different types of blankets as well to suit every outdoor and travel need. We also wanted to include different uses because people use blankets for different needs. Blankets can be used for hiking, picnics, at the beach or just to the park. We wanted to find blankets that were not only soft but also easily washable and that can handle wear and tear. These blankets were made of top of the line material as well as offer comfort and warmth. We reviewed the top rated travel blankets reviewed by actual consumers. We included both the pros and the cons of these blankets in order to get a realistic and honest view of the quality of them. We also followed up with a criteria for evaluation section to let the buyer know how we chose the blankets and what we considered, and what you the buyer should consider when looking for the best travel blanket for your needs. Let’s get into it. This blanket is a travel blanket and a Snuggie combined. It is lightweight and has arm holes that allow the individual using the blanket free-range movement of their arms in order to perform tasks easily while staying warm. It comes in two sizes, 38 x 60 and 40 x 72 and comes in two colors, both grey and blue. It is meant for adults but can be used with children. It is ideal for taking on an airplane and using on long trips in the car. This item is unique due to it having arm holes so that the individual using it can freely do other things while staying warm. This blanket can be used as a blanket, as a pillow, as lumbar support and it comes with a carrying case. This blanket is in the middle of the price spectrum. The justification for the cost is the multi-uses and the convenience of the armholes. Additionally, it comes with a carrying case. This is a more modern looking blanket. It is lightweight and is made of soft materials. It is ideal for plane travel and doubles as a pillow. It comes in two colours and is 55" by 55" when open. It is also machine washable. The material of this blanket is very soft, made of 100% polyester. Opening at 55" by 55" this blanket is also nice and cozy. 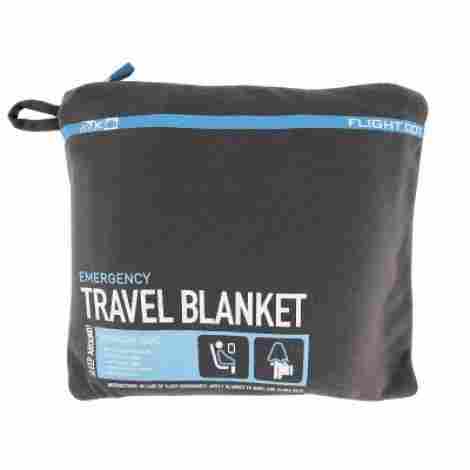 This blanket is both a blanket and a pillow making it ideal for plane travel and camping. This is mid range in price. The price is justified because it doubles as a pillow, it is soft and has a more modern design. This is another compact blanket. It is lightweight, puncture proof and fits up to 4 people. It folds up small enough to fit in a pocket and comes with a carrying bag. It measures 44" by 63" when open and comes in one colour (black). 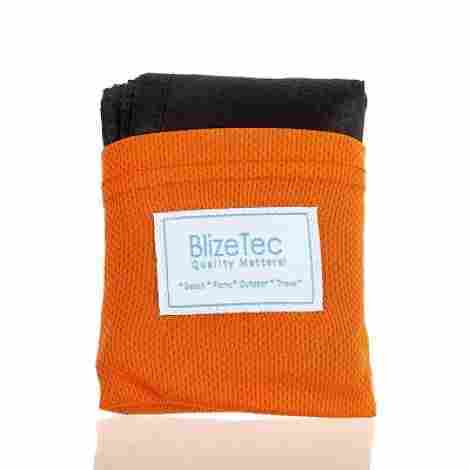 This travel blanket comes with a lifetime warranty as long as purchased directly through Biztech through the Amazon website. This blanket is tiny folded up but is puncture proof. It is also waterproof. This travel blanket is very inexpensive. Between the durability of the product and its lifetime warranty this is meant for those on a budget. Overall this is a great bang for your buck. This blanket is super cozy and made of micro-fleece. It comes in one size (the dimensions are 50" x 60") and comes in 15 fun and neutral colours. It only weighs 1 pound and, is lightweight and compact. Despite this blankets size it is very lightweight, weighing about 1 pound. It also folds up into a very small bundle making it ideal for hiking (and any other activity that requires a lighter load). This blanket comes in 15 different colors ranging from black and grey to leopard-spotted and pink making it easily individualized for different types of personality types. This blanket is not only easy to carry around and ultra-soft but it is also super inexpensive. This will not hurt the wallet and is definitely a bang for your buck. And considering it comes in so many different colors it can be purchased for everyone in the family without breaking the bank. This blanket is meant for the beach. It is lightweight and portable too and is made of water and sand proof materials. It comes in two colors (orange and white mixed, and pink and white mixed) and one size (185 by 142 CM). This blanket is made to sit on the sand but also uses the sand to weigh it down with little pockets that are meant to be filled with sand. This blanket has four sand pockets meant to hold sand in order to hold the blanket down. This would prevent wind from carrying the blanket away. The pockets can also be used to hold accessories instead. You will never have to worry about this blanket carrying sand into the house because it is made of materials that don't grab onto the sand. And if the material ever stops working for you it comes with a 1-year warranty for peace of mind. This blanket is very inexpensive. With all the additional features and the fact that it will not, under any circumstances, blow away this blanket is worth the buy! This little pillow blanket combo is perfect for cuddling up with. 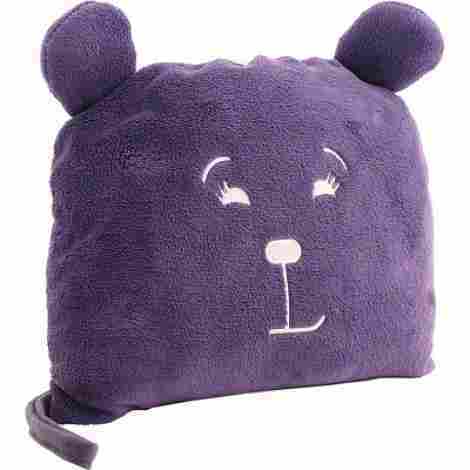 Ideal of children, this pillow folds up into a cute little pillow with an animal face on the front making it fun and appealing to little ones. It comes in 4 different colors (yellow, black, purple and red) and it 100% machine washable. This little blanket doubles as both a pillow and a blanket. It is perfect as an additional little blanket for camping just in case the night gets a little too chilly. This pillow and blanket combo is adorable and soft. It has little ears on the top to triple as a stuffed animal. Kids will love their little blanket, pillow and toy combo. This pillow is mid-range in price. The price is justified by the fact that it is so cute and cuddly. Also because it comes with a convienent carrying case and is made of ultra-plush fabric. This is an incredibly compact travel blanket. 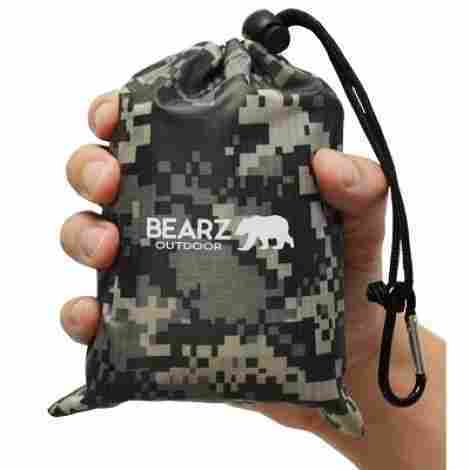 It is waterproof and sandproof, and it can be used for travel, camping and hiking. It also comes with a convenient carrying case. The best part is how small it folds up. It can fold up enough to hold it in the palm of your hand. This little guy is small but tough, perfect for your next hike. It also comes in four different colors (green, red, camo and blue). When folded up this blanket can literally fit in the palm of your hand and is super lightweight. It comes with a draw string that has a clip on it so that you can clip it on your backpack and go. 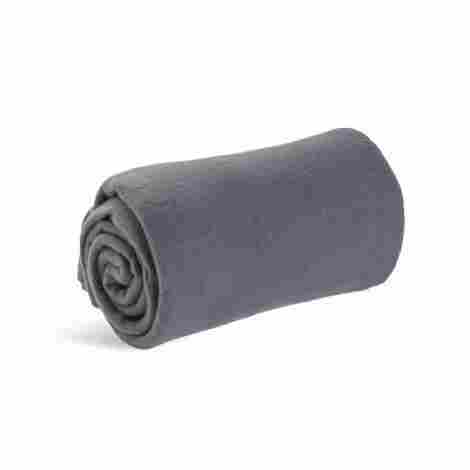 This blanket is waterproof, sand-proof and puncture-proof. In addition to the durability despite the potentially damaging elements it is also machine washable. This travel blanket is on the higher end in price. The justification for the price is definitely the quality of the materials used to make this blanket. It may be the last travel blanket you ever have to buy. There is more of a risk of you losing it due to its tiny size when folded up than there is of environmental damage. The cost is worth it due to its value. This travel blanket is extra large, measuring 71" by 59". It comes in 6 different colours (light green, blue, black, orange, grey and dark green). It is ideal for camping and picnics. This is one of the biggest blankets in this article. 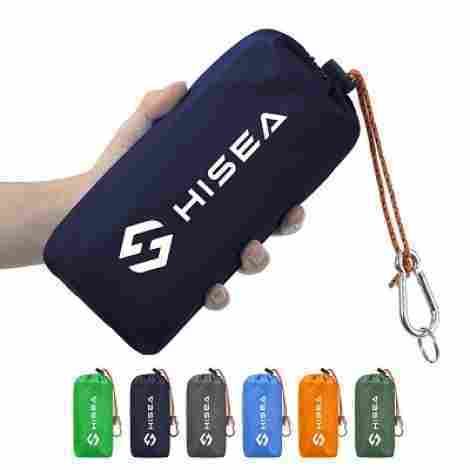 It is oversized, ideal for holding up to 6 people and is waterproof making it perfect for camping. This blanket has pockets that can either hold accessories or can hold rocks to keep the blanket down. It also comes with 4 long anti-corrosive steaks to anchor the blanket down. This travel blanket is on the higher end in price. The justification for the price is due to its functionality, its durability and convenience of it. If living in or traveling to windy climates this blanket is an ideal choice. This is a cute 54 by 84 inch bag. It comes with a carrying case and has a nylon siding making it waterproof. The inside layer is a cozy fleece material. It also comes in 7 different colours. 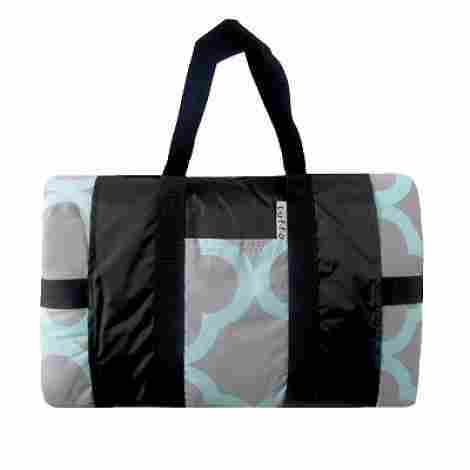 Because of the size and waterproofing qualities this blanket is great for picnics. This travel blanket is on the thicker side, so it is ideal for babies. It has a soft fleece lining making it comfortable to sit on as well. This blanket is mid range in price. The justification for the price is the level of comfort it provides. Because of its waterproof qualities, that it is thicker side and has a fleece lining this is ideal for those looking for something comfortable. This blanket comes in fun colours and is made of very soft, plush materials. It also doubles as a pillow and has a front pocket for accessories. It unfolds to 35 by 46 inches. It also comes in 6 colours (blue, purple, green, yellow, brown and grey) and doubles as a pillow. These travel blankets come in bright and fun colours. It is ideal for expressive styles and children. This blanket is made with ultra soft fleece. This blanket is ideal for long flights. This blanket is mid range in price. The price is justified by how comfortable it is. This blanket is ideal for those who want to cozy up on flights and road trips. In conclusion, when purchasing a travel blanket you want to make sure that the blanket you are choosing suits the activity that you will be using the blanket for. You want to take a travel blanket that does well when on the water but won’t collect sand. And you don’t want to take something meant for taking to the beach if it doesn’t do well wet. Additionally consider the materials the blanket is made out of. If something warm and cozy is needed for an activity like a plane ride or a road trip, something plush and soft would likely be desired. In these situations you are looking for something made of cotton, jersey, micro-fibre or fleece. If you are doing something that requires more warmth and weight for activities like camping or boat rides you want something made of flannel or wool. If you are doing something that requires protection from moisture and won’t collect sand then you want to find something made with at least a nylon bottom as this will not only stop the moisture from seeping through but will also stop the collection of sand. We hope that this list was helpful in your decision in purchasing the best travel blanket for you. 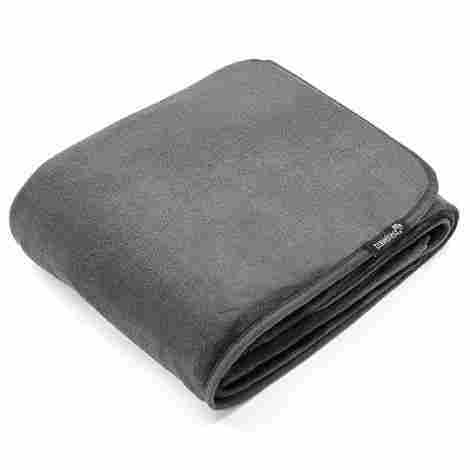 This is one of the most important items to consider when purchasing your travel blanket. The reason for this is if it is not made of quality materials the blanket will not do what you need it to. Additionally, the material will break down much easier and you will find yourself buying more blankets. Spending the money and buying a blanket that is made of quality materials will end up saving you money in the long-term. This will also save you time. If you are buying a product that is not meant for the activity you are performing you will also find yourself not using the product that you purchase due to its ineffectiveness so it’s important the material being used is for the activity being performed. Qualities in materials are things like drying time, whether sand/dirt stick to it, the weight of the material, washability of material, strength of the material, comfort level and reflective qualities. Considering all these characteristics as well as the quality of the material will save the buyer time, energy and patience when buying a travel blanket. The manufacturer is also something to consider when buying a blanket. The reputation, the location, and the experience all come into play here. The reputation of the company will let the buyer know whether the manufacturer has past issues with their product. This will come in especially important when buying online as most of us do. We want to know that the product we are waiting for is a good product. There is nothing worse than waiting a week for a product, just to get it and find out that the product is defective or not quite what we were looking for. Additionally, if the company has a poor reputation returns and customer may be a real issue. When looking for a good quality product we want to ensure that we are at least able to return it with relative ease before purchasing it. The location of where the manufacturer is also important because this will dictate travel time. Though many companies put the research in to make a better product make sure that the company is familiar with the climate you will be traveling in to ensure that they are covering the problem that you are attempting to solve. Again, with buying and then returning, shipping may cost more if the manufacturer is really far away. Experience is important because new companies don’t have the opportunity to fix any design flaws that were brought up via consumer reviews. Additionally, the newer the company the more likely the company won’t survive cyclical buying cycles. Experience is something everyone should consider when choosing the manufacturer they are buying from. Even though these products are just blankets something to consider is if the blanket has more than one function or additional features. Some of these blankets double as pillows and others have little pockets for additional storage. Some also have a waterproof material on the bottom side to protect the purchaser from getting wet. The additional features of the blanket help the consumer see what is available to them and where these products can be used. The pillow function is very helpful when flying on a plane or traveling in a car. It can also be handy when camping, offering the buyer additional warmth if required or neck support if not. Some of the blankets offer a line with a hook on the storage bag to make it easier for hikers to hook onto their backpacks or belts. The additional items included will help as well. Do the blankets have attached straps so that it can easily fold up and stay folded up when not in use? Does it come with a carrying or storage case? Does it have a waterproof shell to keep it dry if stored outside? The additional features of the blankets will make a huge difference when traveling with these products. Can the blanket easily be cleaned? When traveling with blankets the one thing that is guaranteed is that the blanket will definitely be exposed to different environments than your basic couch or bed blanket. Because of this, the blanket will more than likely end up dirty. We use these blankets to cover our bodies so we want something that is clean and comfortable. The washability of travel blankets is important for that reason. Can it also be washed with all soaps or are special soaps required? Can it be machine washed or does it have to be done by hand? Does it need to be hang-dried? Will the materials breakdown quicker or will it lose its function if washed frequently? Knowing the washability of travel blankets will go a long way in the general maintenance of the blanket. It will be especially handy when considering your space. If your home doesn’t have an area that a blanket could easily hang dry then you don’t want to invest in a blanket that requires it. Additionally, if the washability is poor then it’s going to make the material less comfortable to use and will more than likely be hard on the skin. If the material doesn’t do well with certain types of soaps or bleaches and buying a new special cleaner may be a pain. 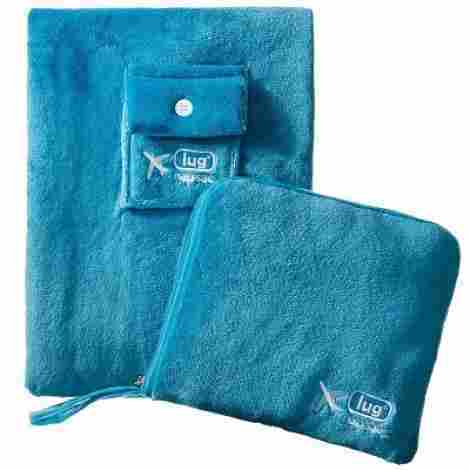 Considering the washability of the product and its materials is very important when considering buying a travel blanket. We briefly went over this earlier but the size of the blanket is going to make a difference especially when flying on an airplane. With our coats, shoes, and blankets, our suitcases can get really full, really quickly. Considering how you travel will help when purchasing a travel blanket. If you usually travel quite heavy, looking for a smaller blanket may help with both the room in your carry-on or the weight of your check-in bag. It will also help when having to store your blanket. Lighter blankets can also be less warm and a heavier blanket may be required when camping or hiking. Additionally, the overall size of the blanket when spread out will be important. If this blanket is only used for one person on an airplane then a lighter smaller one would be fine. But if using a blanket for a picnic with multiple people sitting on it will not work if the blanket is small. Also, the size of the person using the blanket will change the requirement for the size. If the blanket is being used for a child then it will be a very different requirement than it would if used on a full grown adult. Finally, the size will also affect the comfort level of the individual using it. If the blanket is too small it will defeat its purpose which at the end of the day is keeping the individual warm. Something too small will allow too much airflow and the individual using it will not be comfortable and thus, again, completely defeating its purpose. The final item we considered and want you to consider is the warmth of the blanket being used. When flying the need for warmth is less important because the plane is kept warm with heaters but when using a blanket when out by a fire or when camping will require a heavier material. Considering how heavy and warm the blanket is very important. Additionally, having a barrier between the individual and the object the blanket is being used for will make a difference. Whether it’s the cold air or a wet ground, the barrier needs to do its job in order to do the job that it’s being purchased to do. A heavier material may be needed to keep the buyer warm but a stiffer material may be needed to keep the buyer dry. Considering warmth and the environment going into the activity will help the buyer find the blanket that is right for them and the activity they are performing. Q: Are travel blankets easy to clean? All the travel blankets in this article are machine washable. Typically they are easy to clean. Make sure to read the packaging to make sure you can throw it in the wash, otherwise you may need to wash it by hand. Anything with waterproofing should be washing in low heat and laid out to dry in order to keep the waterproofing in the best condition. Q: Should I be putting my travel blanket in the dryer? As mentioned above, anything with waterproof material should be hang-dried. Anything made of fleece or micro-fibre can be thrown in the dryer. Anything will last longer if it is hang-dried. Q: Are travel blankets made of toxic materials? None of the blankets in this article are toxic to the touch. Everything is safe for everyone including babies and animals. Q: Are all travel blankets waterproof? No. The waterproof blankets have a nylon backing. The travel blankets in this article are all quick drying though. Q: Are travel blankets breathable? A: They can be if they are made of more plush materials. When they are fleece they are less so and anything that is waterproof wouldn’t be. Q: Will the travel blankets that can be used on the ground protect you against heat/coldness of the ground? Typically no. On particularly cold or hot days dressing appropriately for the weather is wise. Q: How big of a travel blanket do I need? It depends on what they are being used for. Blankets that are used for travel should typically be smaller in order to fit in luggage better. They are also usually used for one person to lay under. The larger, water resistant ones typically are bigger and are used for laying on the ground for the purpose of sitting on. Q: What materials should I look for when purchasing a travel blanket? Again, it depends on what you are looking for. If you are looking for something to stay warm you want to look for blankets made of micro-fibre or more plush materials. If you are looking for something that is waterproof consider nylon. Nylon is more durable and will typically last longer. Micro-fibre due to its softness tends to be less durable. A nice middle ground is fleece. Fleece is both durable and soft. Fleece will also keep you warmer and will dry quickly. It is not waterproof though.